It's said that style is all in the detail. But is choosing a correctly fitting jacket with shoulders that perfectly correspond with the sleeve length, a detail? Is favouring a pair of trousers with an 18cm hem width over a 22cm hem width a detail? So before delving into the details, let's get this straight: style is all about the essential. In other words, the cut. To dress well you must know your body well. Its qualities. Its weaknesses. Its irregularities. Maybe one shoulder is slightly higher than the other. Or perhaps one calf is more muscular than his alter ego. Sunday footballers know what we're talking about. And ultimately you have to accept this. It's not always that easy. When larger gentlemen go into shops they tend to try on jackets with shoulders that are too small and force the buttons to fasten. Smaller men will do the opposite. And if they are not well accompanied, badly advised or bad tempered, then they will end up buying a garment that doesn't suit them and in the long run will only deepen their complexes… In reality it's actually very easy to get the right size and the right cut. In a shop you should try a jacket on and wear it for a little while. Stretch the arms. Pick something up off the floor. Sit down and lean forward, as if seated at your desk. The salesperson might be a bit huffy, but you simply cannot try on a jacket and stand motionless in front of the mirror. The right jacket must fit the shoulders, without contradicting them, the sleeves should stop 1 or 2 cm before the shirt cuffs (3 cm if you opt for French cuffs, which require cufflinks); it should be long enough to just cover the derriere, without hiding it completely. 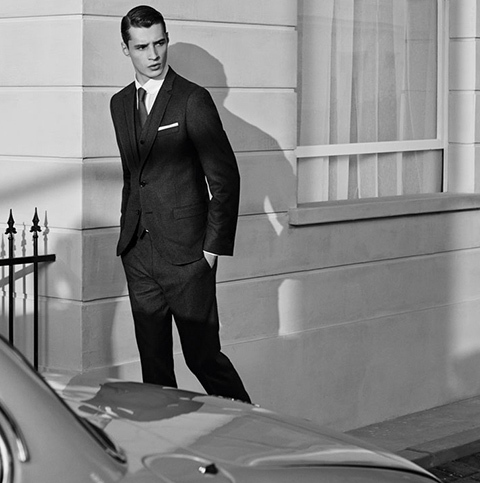 The right jacket should outline a silhouette without hindering any movement. The laces test is the best in the field. Try and tie your shoe laces whilst wearing the jacket you like. If it is impossible and you can't bend down then the jacket is too small. If it's easy and you feel nothing, then it's too big. Ideally you want something in-between. After having considered the shoulder breadth, now question the waist. Can you fasten the buttons easily? Does the jacket pull when closed? Do you feel comfortable? A button-up jacket should not pull. It should nip in the waist without strangling it. The question is particularly crucial for city suits and those worn for business and ceremonies. Because all of the above require you to keep the jacket closed, unless you sit down… A laid-back jacket, soft, unlined, worn with chinos or jeans, will tolerate being left open much better. But that's still not an excuse to buy a jacket that's too small and impossible to button up. Be reasonable. And check out the vents at the back of the jacket. They might open when you sit down, but they must remain closed when you're standing up. That's the rule. In terms of cut and size, it's always a question of reason, balance and good judgement. It's a thin line between waisted and too tight, but it's crucial. This has to be learnt. It can take time and observation but most of all requires good sense. If you buy a work shirt which you'll wear with a tie, do you want the collar to strangle you when you do it up? On the other hand if you're after a weekend shirt, why worry about doing up the collar? Concentrate on the shoulders and the waist. When it comes to trousers balance is, once again, vital. 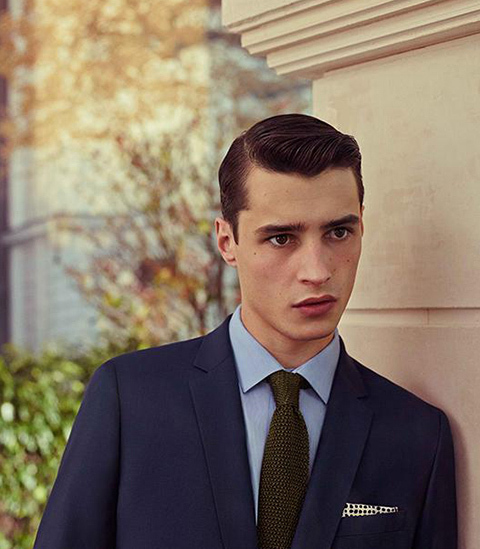 For on-trend elegance, a narrow cut is called for. And that's good news. As long as you don't confuse a narrow trousers with a something skin-tight. The first is nice to look at and wear. The second is neither. Fitted, yet comfortable, De Fursac trousers can be lengthened or shortened according to the length of your legs and your tastes. Some men like their trousers to be short to reveal their malleolus. It's a trend. And why not? These narrow “ankle grazer” trousers often make for a great silhouette. But lots of men aren't keen to show off their ankles. Their trousers should break (just once, no more) on their shoes. All of this is a (subjective) question of style. And the surroundings… Because the “ankle grazer” look works better with rounded toe, statement shoes than delicate, pointed shoes. The question of proportion is quite rightly very important. With an outfit everything should be well proportioned, unified and coherent. 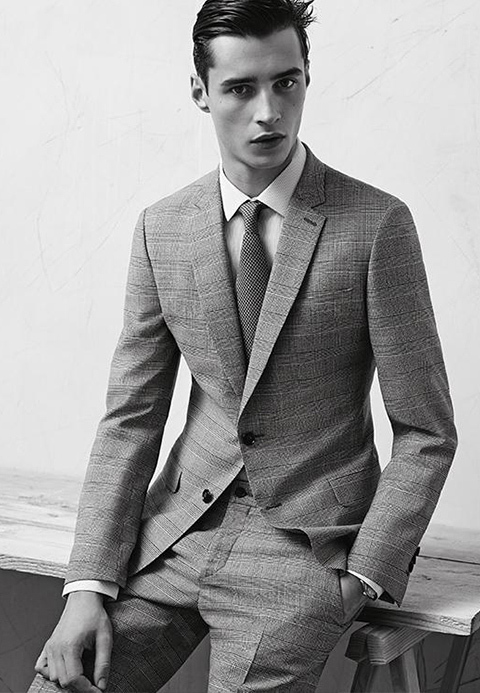 For a jacket with narrow lapels you will need a narrow collared shirt, a narrow tie and narrow trousers. A narrow belly too. For a jacket with larger lapels, it is of course the opposite. Everything can get a bit bigger. Even the trouser turn-ups. Even the belly. If you succeed in harmonising all the above, the hardest work is done. Now you can move on to the famous details. Now you can have fun with the accessories. You've already won the game. And held the trophy high. Note by Marc Beaugé and François Blet.